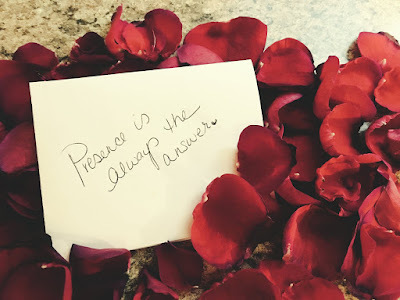 Presence is always the answer. On days like today, the anniversary of 9/11 (Wow, where did 15 years go? ), we often stop to remember… to find meaning amidst the chaos, to honor those lost, to celebrate their lives, and to be still and humble and vulnerable and full of love. But how quickly do we fall back into our old patterns? Most days, we are so consumed by our own human drama that we lose sight of the big picture and what matters most. We are stuck in a hamster wheel, obsessing over the past or worrying about the future. We play the same record of old stories we've told ourselves repeatedly and now believe. It's on loop. Playing and playing and playing, forever dictating our thoughts and actions. And consequently, our external lives. The cure to this madness, as we briefly experience on days like 9/11, is Presence. Presence is always the answer. It can - and will - bring us back to our heart-centeredness: that space inside us where we feel a deeper connection and meaning to all of life. A space where we move in sync to the One beating drum, the heart beat and pulse of All There Is, the natural rhythm and flow of existence. This is the place where we stand still, breathe, and honor life. Babies and children are masters at Presence. And they’re also great Teachers for us. They’re probably born with more wisdom straight out of the womb than we have and practice as adults! I have found that there is much to be learned from watching them as they journey through their first few years, in particular. They are definitely not stuck in some old story about the past. They are not all that concerned about what's for dinner tomorrow or the next day, or what may come to pass in the following days. For the most part, they are very grounded and anchored in to the Present moment. Receiving: Little ones have absolutely no issue asking, and actually expect to receive plentifully! They're not shy about asking for what they want, and they are definitely not too proud to accept their granted wishes. Asking and receiving come very naturally to them. They feel they are more than worthy, and in fact, they may not understand why you say “no!” As adults, we develop all sorts of “lack” language and stories as to why we cannot receive or why we can’t have something, or shouldn’t ask for it or expect it, but this is a non-serving and very limiting behavior and mind frame. Each one of us deserves all that we desire. Ask and it is given. Children understand this, and they know you must ask if you wish to receive! If you pay attention to kids for a while, you’ll come to learn how easily and effortlessly they give, ask, receive (and repeat) as a natural and instinctual way of being. Forgiveness: Kids do not generally hold onto anger or resentment or grudges. Most times that something (perceived as negative) happens, a moment later they are off, happy, again, back to whatever they were doing or onto something new that interests them. They rarely self punish, and forgive themselves almost instantly for whatever it is they have “done” (or said, or didn't do, etc.). Babies certainly don't understand hate or a lack of forgiveness. Their minds are very clear, and they have not yet had time to create attachments and meanings and stories about their surroundings and the people in it. Once a situation is gone, kids just let the thing go. They’re back to being “best friends” with the kid that knocked them down or stole their pencil. They’re back to playing after dishing out a bad attitude to Mom or Dad. Once the moment is over, it’s over. And they’re over it. Wow, what a powerful way of being. Gentleness and Acceptance: Babies and children are gentle (with themselves and others) and overall, very accepting. If they can’t reach the toy they want, they just keep trying. If they fall when they are learning to walk, they get back up and try, again, a moment later. You’re not going to catch a toddler beating himself up over the fact that he didn't poop in the potty today. Nor are you going to hear a young child say how “dumb” or “fat” or “worthless” they are just because they didn’t get something right the first time. They just accept where they’re at, what is, and move on with a gentle presence and grace. Think about how much happier we would all be if we could accept where we are at and just keep trying, again, with as much enthusiasm as the first time? Love: Babies and children are vulnerable and loving. They give with their whole hearts and are not afraid of getting hurt. They do not withhold their love, or guard it, (or pretend to love something they don't!) until they have learned over many years that perhaps being open is risky. Babies and children smile and laugh and hug and kiss and touch and play and give (and receive) openly and willingly and abundantly. They are so brave, so bold, and so beautiful. What a miraculous blessing, to witness love flowing freely to and from children and babies. No limitations. No boundaries. No walls being built to keep love in or out. Just a pure flow of pure love and light energy. Play: Kids do not take life too seriously. And they understand the importance of play! You’re not going to hear a child tell you that they can’t play just yet, they have to clean up their room first (maybe a select few tidy gems, but not the majority). Or that the day is ruined because it’s raining outside. Play is a creative expression of our imagination and our Self. It is at the root of manifestation and an incredible attribute that children possess. Play keeps us totally present in each new moment, and in touch with our creativity and inspiration (which means literally to breathe in and be filled with Spirit). Expressing Self: In addition to play, babies and children have no filter when it comes to expressing the Self. When they are upset, or scared, they cry. When they are happy, they smile and laugh. They show their emotions and feelings verbally and physically and without censorship. They’re not embarrassed to fart or pick their nose, or if they fall or don’t win a game. They just haven’t learned judgment in that way yet, or to expect to be judged or nitpicked or disapproved of by others. In this way, they do not harbor bad feelings. And like forgiveness, they move through each moment without taking the past with them. They are unapologetically themselves, here and Now. If they feel like yelling, they don't care if you're at the supermarket or church. If they want to cry, they're going to cry. If something is funny, expect a fully-body-and-belly laugh right then and there. Adults find this embarrassing sometimes. But really, it’s magical and beautiful. Intuition: Little ones are very sensitive to energy, observant and in-touch with their feelings. They haven't yet learned to question themselves. They know their bodies very well. They know when something doesn’t feel right. They know when the dog is sick. And they know when Mom and Dad are not happy. They’re much more empathic and intuitive, as they are closer to their Source energy and alignment than most adults that have learned conditioned behaviors and responses. Their receptors are “clean, shiny and new." Observing: Children and babies observe without judgment or attachment. They see a thing for what it is, in the moment. They learn by using all their senses to gather information, and by using their intuition to feel it out. They also look to adults and the people around them to develop a sense of things. When a baby falls, she will stop and look to her parents for their reaction, before reacting herself. If they get scared, she will most likely cry. But if they laugh and clap, baby will most likely smile and laugh, too. They see life with new eyes, and clear lenses. Everyday is a clean slate. Clarity: Children also see with clarity. They have eyes of awe and wonderment. Everything is new and fresh and fun and exciting. They are enthusiastic, and open to seeing things for what they are and all they can be! Without judgments and attachments, they can see farther than us adults can with our narrow, limited view that is designed by our past experiences. Without bias, they can decide what they think and feel about a person or thing in real time, based on what they see, not what they think they “know” already. Optimism: The world is a treasure chest to babies and children. They do not seem to understand the concept that the world isn't full of endless and infinite possibilities and that they can do, have and be whatever it is they want… when they want it, how they want it and where they want it. They have an abundant mindset. And this keeps them inspired, enthusiastic and energetic. And that inspiration then fuels their continued optimism and limitless, abundant-thinking. It's a very simple yet tremendous positive cycle of cause and effect. Unfortunately, as we all start to grow older, these powerful attributes become diminished by an increase in learned conditioning. We show less and less of ourselves, begin to build walls to guard our hearts, and start to self-loathe instead of self-love. But, our lives are so short and so precious and so meaningful that it does not serve us one bit to actually “grow up!” Kids have got it right. We should be listening to (and learning from) them! I was drying my hair yesterday morning. My almost-10-month-old was on the floor nearby. When I turned the dryer on, her eyes grew in size. She stared at it, listened to it, observed my reaction as I lifted it to my head. She waited to see what reaction I would have to this very strange creature or contraption she had never seen before. Remember, babies and children are not exposed to everything we have or use, and have absolutely no idea what most things are! So, she was very intrigued by the hair dryer. She kept coming closer, and maintained steady eye contact to make sure it was safe. I laughed and smiled, and she did the same. It became a pleasant association and experience for her. It was really touching to observe her as she observed me and the hair dryer and displayed most of the characteristics mentioned above, in just a short few minutes. It was beautiful being so present with her and sharing in this new moment with her. And I didn't have space or time to think about something that happened to me, or what I am going to do about something in the future. I enjoyed this moment and enjoyed my daughter. What better way to honor Life than to fully experience each moment, thereby living our full potential with every passing breath? By appreciating the beauty and wholeness? Connectivity, variety and contrast? Today, on 9/11, I hope you reach some form of inner peace as you remember and celebrate those that have passed on from this life. And in their honor, celebrate your own life, as you're living it. Don’t push it off for tomorrow: a tomorrow that is unknown, and not guaranteed on this planet. All you've got is Now. And the answer to all of your problems is Presence (...and being a big kid!). Do not waste your days, dear friends. Reach for fulfillment and totality. Revel in life and play and see with eyes like a babe. Be open to receiving the gifts this wonderful world has to offer you. Listen to the whispers of your heart and soul. She will not lead you astray. Embrace each other. Share love and equality. Hold hands on this walk of Life and hold one another up. Make the most out of each moment in time. And be free. Free to express. Free to love. Free to share. Honor one another. Honor your own light and divinity. Keep it close to your heart and let it guide your way. In peace, we leave you. Go. Be free, dear children.